I could swear I did my visiting teaching for October. But what I'm actually remembering is doing my visiting teaching for September. Is October going by really fast for you? We went to Disneyland last weekend. It was fun. 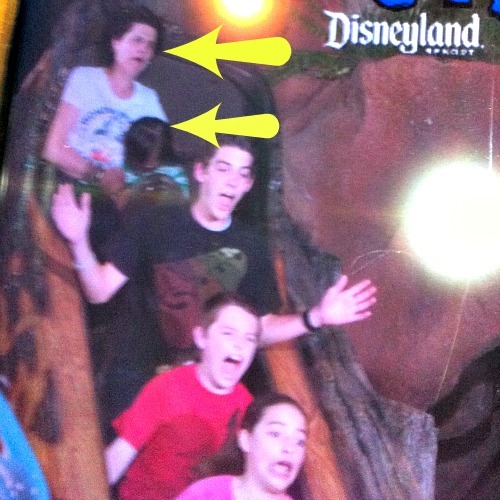 Every time I went on Splash Mountain I told myself to be cool. But I'm always surprised by the sheer drop. It's scary and I can not disguise my fear, even for a photo. Specifically, "Really? Seriously. Omg is all I can say. Zombies are fictitious!!!! Dead people coming alive again? Really? Not to be mean but I cannot believe this person is so stupid to actually blog about this and scare her kids trying to “prep” them for it? It can’t happen because dead do not come back alive!! You are ignorant!!!" A total waste of time since zombies are, apparently, fictitious. So you don't have to ruin it with a coat. I LOVED writing this and I LOVE talking about it. Tell me who shaped your world in the comments or when you see me in real life. Mostly a tribute to Amy, Rory, and Brandon Flowers. This is a scary one. Do Morning People Make Better Moms? I think maybe they do. Hand Me Downs: What do You Keep and How do You Store? I want to get rid of everything. My speech for Justin Hackworth's thing. Cute pictures of my kids. I know that's link overload. I just don't want you to miss anything. Everything's all zippidy-doo-dah and then boom, you're falling to who knows where! Reasons why I love/hate Splash Mountain. Did you make your kids wear matching shirts? I do whenever we go to amusement parks. It's the only way to keep track without freaking out. that commenter is gonna be real surprised when the millennium rolls around. or is it the second coming? i get those events all confused. whenever the dead start rising from their graves, she's gonna wish she had heeded your zombie apocalypse post. Okay that was a vague comment. I'm talking about the rude comments you get. So I had to go comment on that one and play "dumb" with you. Is it just me or is she the one looking kind of silly because she doesn't seem to get that everyone else really doesn't believe, it's just fun to play along. ha ha. oh heavens. I loved your zombie post. I linked to it on facebook for my son. Preparing for the Zombie apocalypse is one of our fun things to talk about.